In the oil and gas industry, proper control of your drill pipe is essential to the productivity and safety of your wells. And while you may have a few thousand feet — or more — of pipe taking the weight and strength of your drill, it’s crucial that your collars are up to the task, too. Otherwise, problems with collars can result in costly delays, other equipment issues and missed productivity quotas. Fortunately, at Global Elastomeric Products, Inc., we’ve been supplying the oil and gas industry with high-quality equipment — like oil well casings, drilling machine parts and collars — for well over five decades. So, if you’ve had enough of trying to work with a number of different suppliers only to receive less than outstanding service and poor quality parts, it’s good to know there’s a better, more affordable and reliable way of accessing all the replacement parts you need. High-Quality EUE Threaded Collars and Bell Collars From Global EEE! 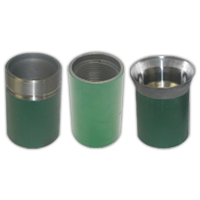 The casing coupling has internal threads machined to match the external threads of the casing. The casing coupling is a small length of pipe used to connect to pieces of pipe together. We have standard collars that are internally threaded has well as threaded collars, threaded on the OD as well as ID. Both standard and threaded versions of our collars are available in sizes ranging from 2 3/8” to 4 1/2”. Because we manufacture our collars — like all of our oilfield equipment offerings — here in the U.S.A., you can be sure of their quality. Plus, you can rely on us to deliver them to you in a timely fashion. Because we founded our business on the premise that providing the best possible service and parts supports oilfield safety and output, we know you won’t be disappointed when you choose us as your collar supplier. What’s more — when you realize we can be your one-stop oilfield equipment supplier, you’ll see why we form such long-standing relationships with so many of our customers. The combined experience and service we offer is quite literally like having a dedicated partner in your supply chain. For more information on our threaded and bell collars, feel free to contact us today for your no-obligation quote.